In the chapter (8) “Blicks at War” of the book The Five-Pound Secretary: An Illustrated History of the Blickensderfer Typewriter that he wrote in 2003 with Robert Blickensderfer, Dutch typewriter collector and historian Paul Robert mentions Lionel James. and not one showing much of him, either. Is that a Blick case on his right? It is certainly a different mode of transport! Punch magazine once labelled James “One of the Princes of the Golden Age of War Correspondence”. Paul refers to James’s endorsements of the Blickensderfer – written to the Blickensderfer Manufacturing Company in Stamford, Connecticut - as a typewriter which in his own experience had stood up to the most gruelling of working tests. 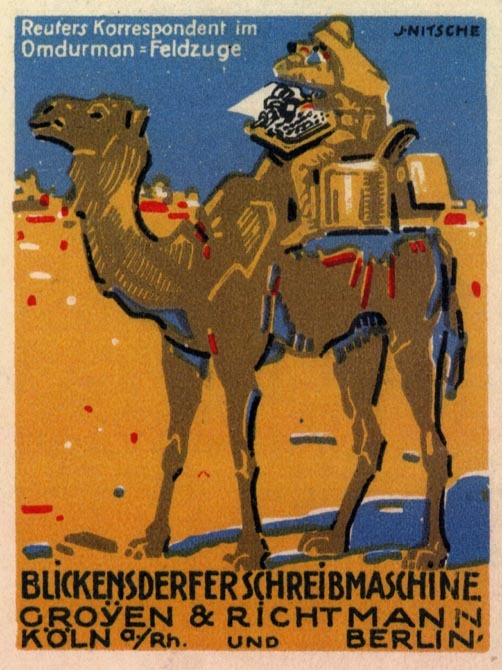 Paul includes one of the letters written by James to the Blick company, in 1901, as well as the “German Cinderella or poster stamp” drawn by Munich artist Julius Edmond Robert Nitsche and showing James typing while riding a camel. As well, Paul has this page from a British trade catalogue. He dates both the stamp and the catalogue from the 1910s. The stamp is headed “Reuters Korrespondent im Omdurman-Feldzuge [campaign]”. It’s one of my very favourite typewriter-related images, and has been for many years. 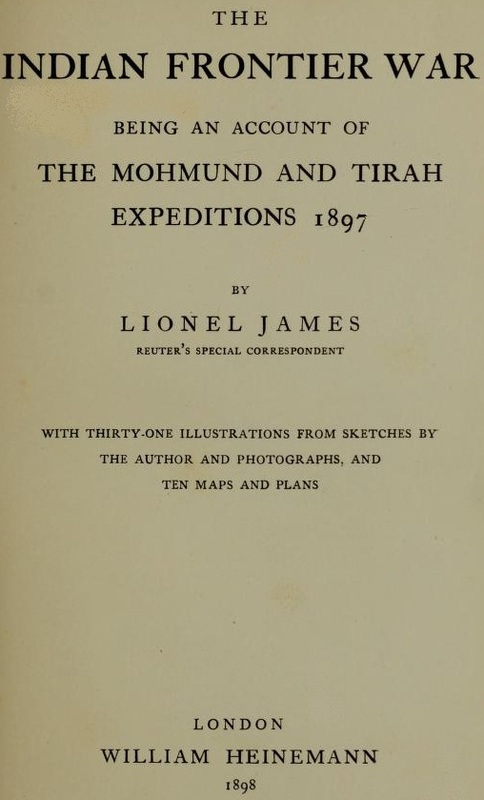 The Battle of Omdurman (September 2, 1898) is where Lionel James first “made his name” as a war correspondent. An army commanded by the British General Sir Herbert Kitchener (below) defeated the army of Abdullah al-Taashi, the successor to the self-proclaimed Mahdi Muhammad Ahmad, marking the success of British efforts to re-conquer the Sudan. Lionel James “stole a march” on his much more seasoned newspaper rivals by banging out his description of the battle on his Blickensderfer and, “by sheer bluff”, contriving to send his story by the river steamer which carried Kitchener's official despatch to the War Office in London. Unfortunately this is the largest size I can find for this image of Lionel James on camelback. Anyone have a larger file please? 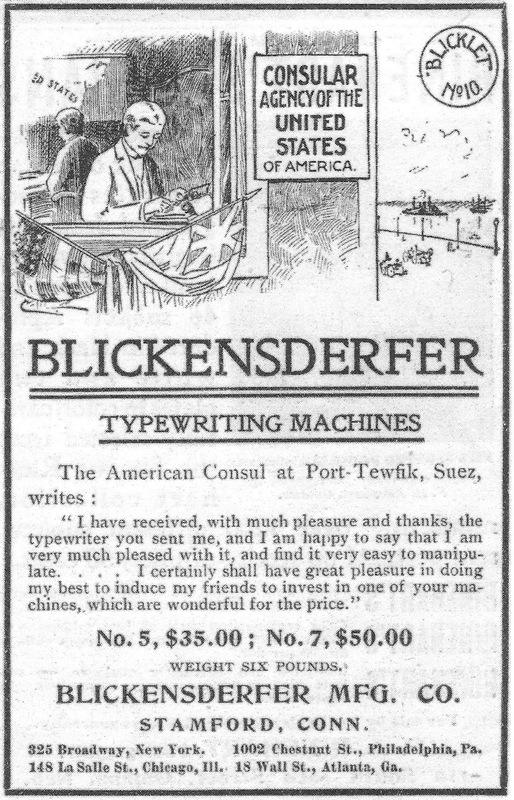 It’s rare to be able to positively identify the subject of a turn-of-the-century typewriter-associated illustration such as this. But the “Reuters [and later The Times of London] Korrespondent im Omdurman-Feldzuge” is most definitely Lionel James. 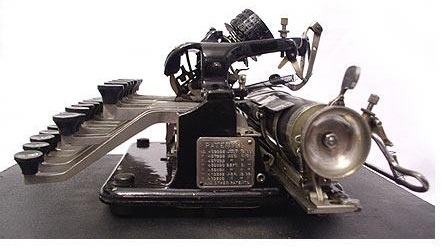 I only became more acutely aware of James after Anne Fadiman contacted me last week about typewriters which were used in entirely different climes: in the Antarctica (regular readers of this blog may know I have posted many times on typewriters taken on expeditions to the South Pole). 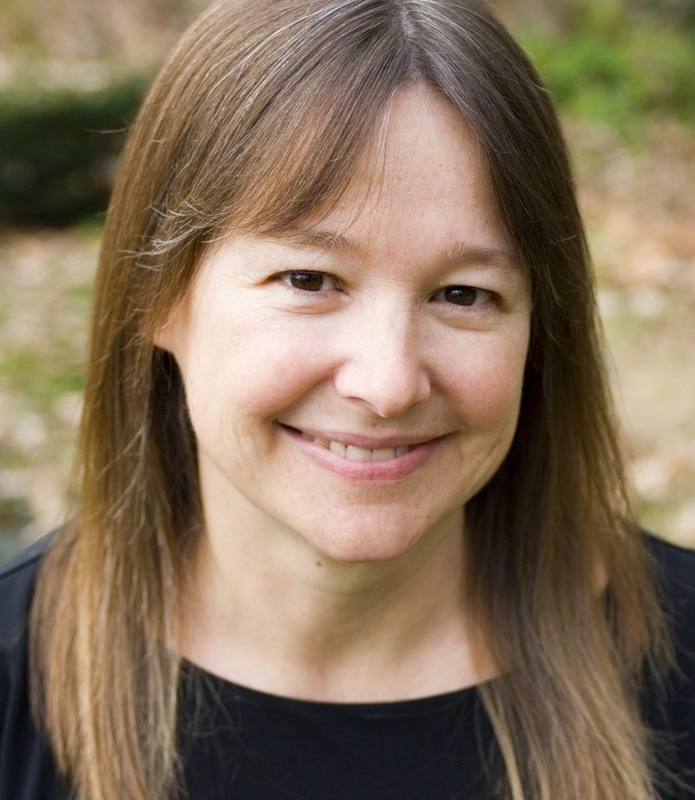 Anne (above) was researching an article for the New York Review of Books that mentions the typewriter used by Ernest Shackleton on the Discovery expedition to the Antarctic. She pointed me in the direction of a booklet (The Typewriter and Phonographic World) which contains a section on “The Typewriter at the Poles”. I eventually found this booklet online and became absolutely engrossed by its contents. And there, among all the other gems, was this letter from Lionel James endorsing the Blickensderfer (one I had not previously seen). 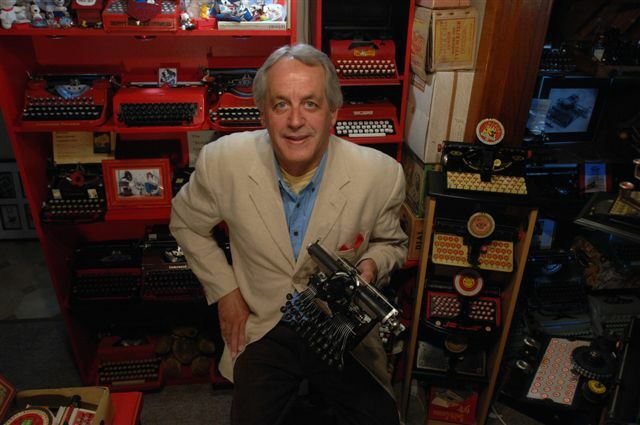 If James used a Blick for all his newspaper and news agency reports, his short stories for Blackwood’s Magazine (among other publications) and his 13 books, he was indeed right to pay the typewriter a glowing tribute. 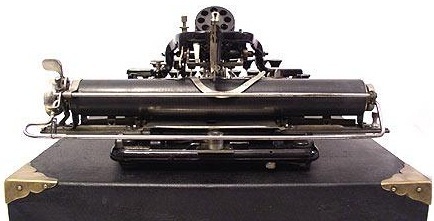 You will note in the letter published by Paul Robert, James says he is agreeing to give the Blick company his typewriter as a memento in exchange for a new one – but stresses his Blick is in “perfect order” – despite its travels and its constant use. 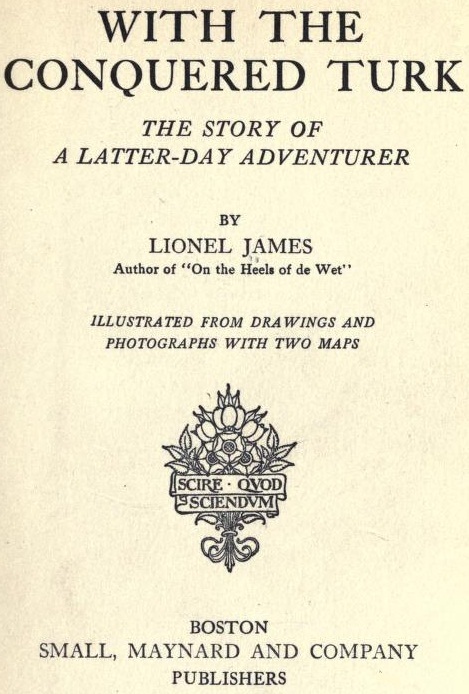 James’s books were With the Chitral Relief Force, The Indian Frontier War, Side Tracks and Bridle Paths, With the Conquered Turk, A History of King Edward’s Horse, Times of Stress, On the Heels of De Wet, The Boy Galloper, A Subaltern of Horse, The Yellow War, Green Envelopes, A History of the Russo-Japanese War and, in 1929, High Pressure; Being Some Record of Activities in the Service of The Times Newspaper (Primarily the Record of My Work as a War Correspondent [1895-1904]). When The Times History of the South African War was being compiled, James collaborated on two volumes. 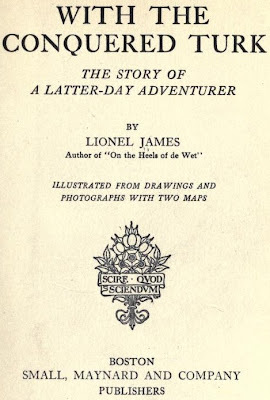 Lionel James was a most fascinating character. 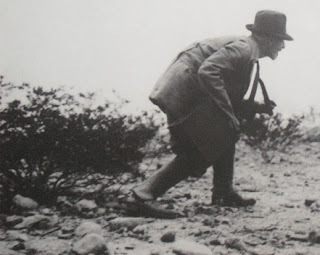 While working for Reuters as its War and Special Correspondent (1894-1898), he covered the Chitral (1894-5), Mohmand, Malakand and Tirah (1897-8) and Sudan (1898) campaigns. Exceeding the call of duty on one occasion, he became involved in a gunfight at the Malakand Pass, supporting and rallying the British soldiers – an action for which, although a journalist, he was mentioned in despatches. From 1899 to 1913 James was Special and Principal War Correspondent for The Times of London. His work took him to Egypt (1899), South Africa (1899-1910), America and Macedonia (1903), Japan and Manchuria (1904), India (1907-8), Persia and Turkey (1907-8) and the Balkans (1909). 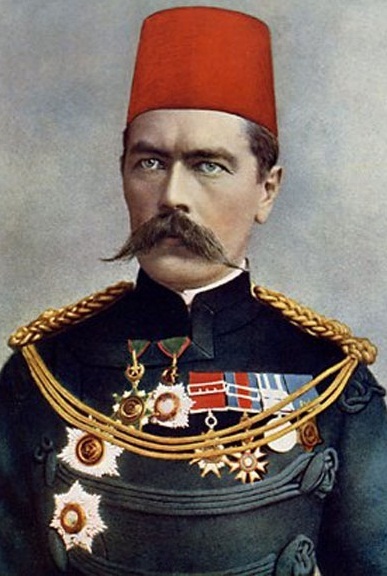 In 1909 he was also with the Spanish Army in Morocco, and in 1910 with the Turkish Army in Albania. Closer to home, James also covered the January 1911 Sydney Street Siege in London. James was congratulated for his vivid account by his editor George Earle Buckle (above). 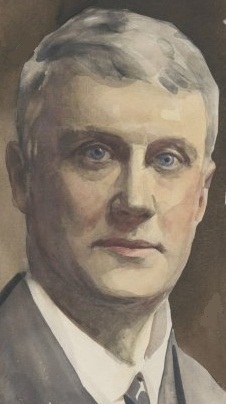 Under changes and cost-cutting measures introduced by Lord Northcliffe to keep The Times afloat, Buckle was forced out in mid-1911 and James resigned in 1913. But James remained active in military matters. He had joined the King’s Colonials in 1902 and by 1914 the unit had become King Edward’s Horse. Serving with the British Expeditionary Force in the Battle of the Somme, Colonel James led a depleted regiment against heavy odds and earned the DSO for rescuing the leaderless remnants of two other British regiments. Twice during World War I he was mentioned in despatches. One biographer says James was born in India, but other researchers say he was born in Teignmoth, Devon, in 1871, and a census form James filled out in 1881, as a 10-year-old student, supports this latter view. Either way, James was a younger son of the by-then retired Lieutenant Colonel L.H.S. 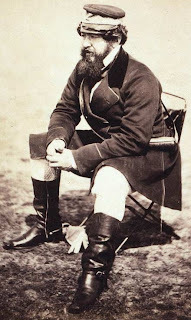 James of the Royal Artillery, who had joined the Indian Army in 1858, and Emma (née Batson). He is said to have been returned to England aged nine, in 1880, to attend a boarding school, Surrey County School (later Cranleigh). He nonetheless failed to pass the South Kensington science examinations. James returned to India at 16, in 1887, and was employed on an indigo estate in Behar, where he worked for 10 years near Muzzaffarpur. 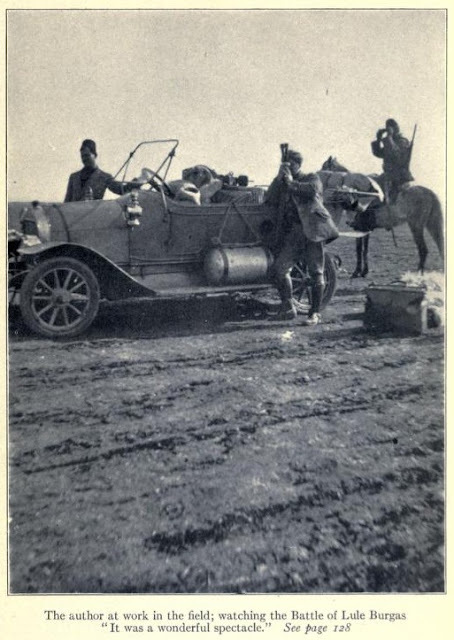 He played polo, which may explain his apparent (I’d say as imagined by Nitsche and others) adeptness in being able to type with a Blickensderfer while astride a camel! James acquired a string of ponies and enlisted in the volunteer Behar Mounted Rifles. By 1895 two of his books of short stories had been published after appearing in Indian English language newspapers. In 1894 an attempted coup using his own horse at the Allahabad racecourse landed James in serious debt. 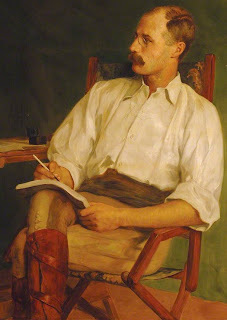 To work it off, he began what was to be a hugely successful career as a war correspondent, working for John O’Brien Saunders (1852-1905), the Calcutta-based proprietor of The Englishman, who needed someone to cover the Chitral campaign (in what is now northern Pakistan) in 1895. James also covered the revolt for Reuters and The Times of India. 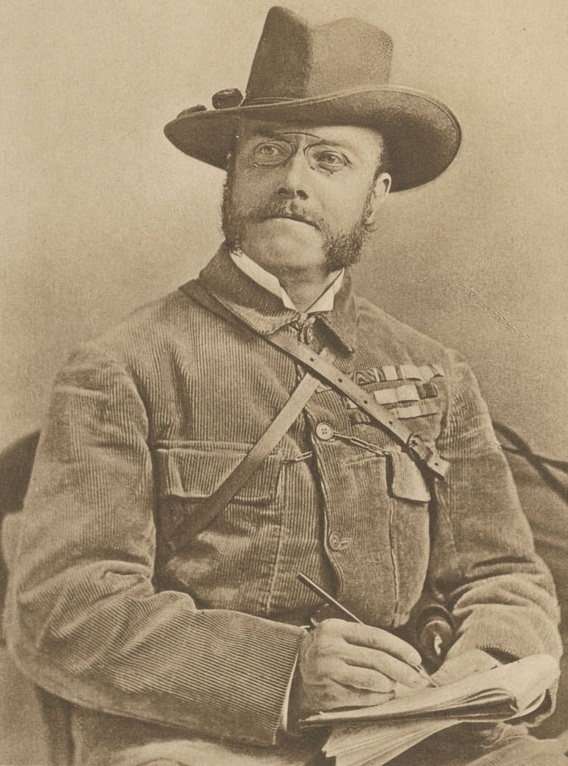 Among the confreres of the then greenhorn James were such noted and experienced war correspondents as Bennet Burleigh (1845-1914, London Daily Telegraph), Melton Prior (1845-1910, The London Illustrated News), Frederic Villiers (1851-1922, London’s The Graphic) and George Warrington Steevens (1869-1900, London Daily Mail). James still managed to hold his own. During this time James also became friendly with the famous Australian-born journalist George Ernest (“Chinese”) Morrison, after whom James would later name one of his sons. 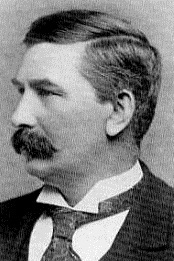 Morrison (above), born in Geelong in 1862, worked for The Age in Melbourne and The Sydney Morning Herald before travelling to New Guinea, Scotland, North America, the West Indies, Spain, Philippines, Burma, India, Japan and China. 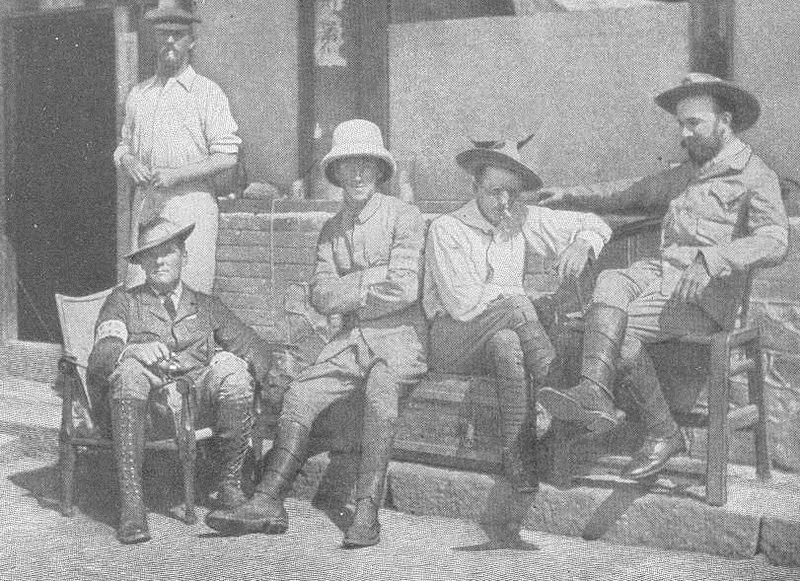 After publication of a book on his travels from China to Burma, Morrison was appointed a special Asia correspondent by The Times foreign editor Sir Ignatius Valentine Chirol. When giving a résumé of James’ character, Morrison said that he was “good, simple, hot-tempered, impatient, self-willed, and able”. But apart from James, only Morrison and William Howard Russell (below), who covered the Crimean War, forsook personal safety to such a degree while reporting. James was not just brave but ingenious. 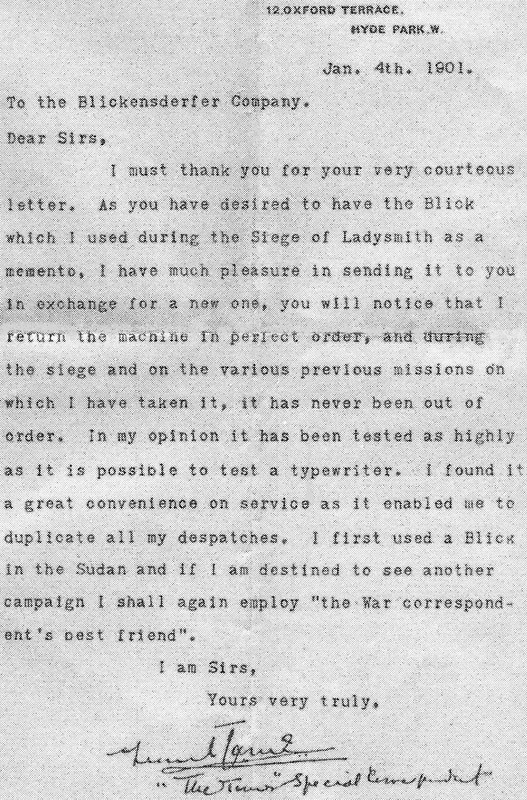 When, Ladysmith was besieged and it was almost impossible to send news from there to Johannesburg, he decided to use carrier pigeons (shades of Evelyn Waugh’s foreign correspondent classic Scoop). Unfortunately, these were intercepted, and a Boer with a sense of humour wrote to thank James for an enjoyable meal. 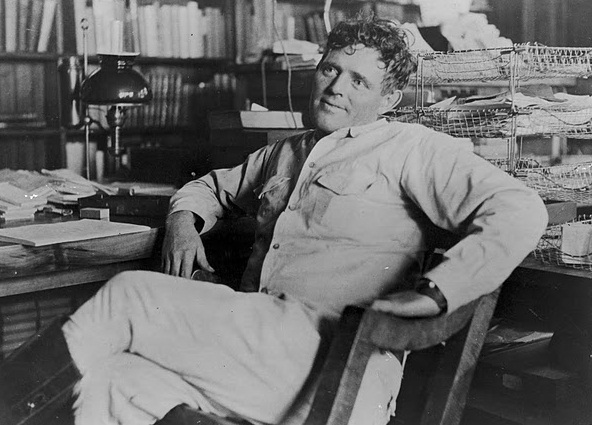 Another famous “war correspondent” James encountered was Oakland-raised Jack London (below). In 1904, London, then just 28, sailed on the Siberia from San Francisco for Yokohama to cover the Russo-Japanese War for the Hearst Press. London travelled with fellow correspondents Frederick Palmer (1873-1958) and the renowned British war photographer James Henry “Jimmy” Hare (1856-1946), who were working together for the New York Globe, Willard Dickerman Straight (1880-1918) working for Reuters, and the celebrated British journalist Ellis Ashmead-Bartlett, among others. 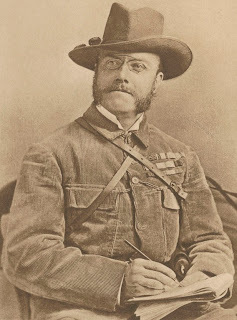 Ashmead-Bartlett (1881-1931), who worked for London’s The Daily Telegraph, was in 1915 instrumental in the birth of the Anzac legend at Gallipoli. 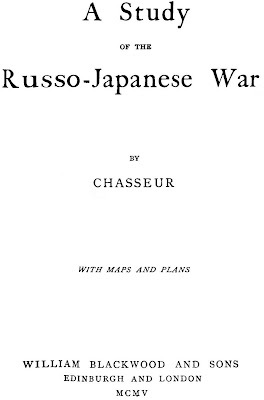 By the time of the Russo-Japanese War of 1904, the rules of engagement for war correspondents had changed considerably. Gone were the days when they were allowed right up on to the front lines. As their ability to report the action increasingly quickened, through the use of typewriters and telegrams, so were they pushed further back from the battle fronts. They began to be drip fed only the sort of basic information armies believed they should have, in the interests of security. *Coming to a secret deal with the Japanese Imperial Navy, whereby a Japanese naval officer went with him to supply his admiralty with intelligence. 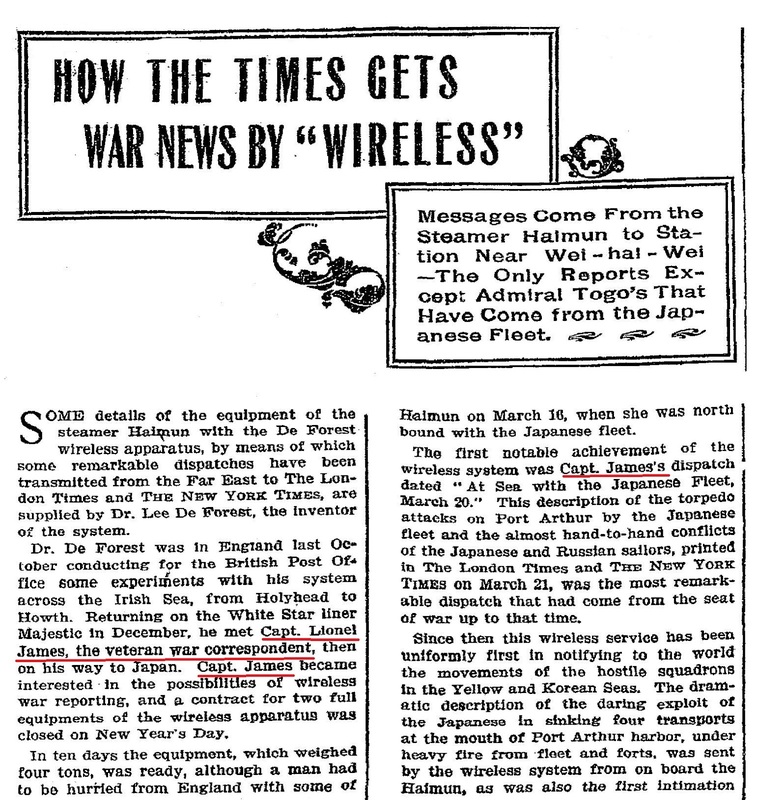 *Getting The Times to pay for his chartering of the steamer Halmun in Shanghai, and installing on it four tons of American inventor Lee De Forest’s wireless equipment. James had meet De Forest (below) at sea in December 1903 while on his way from England to the United States en route to covering the war. *Finding labour to build a 180-foot high bamboo wireless mast on the British-leased treeless promontory of Weihaiwei on the China coast. Through these efforts, James was able to enter the conflict zone of the war at sea. 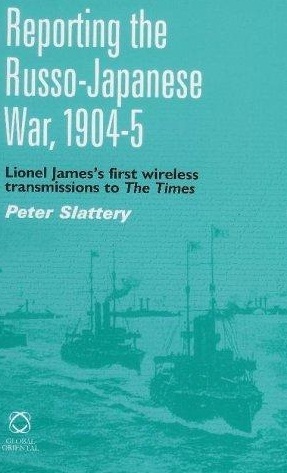 Thus James became the first war correspondent to employ wireless equipment to transit his copy. This achievement is the subject of a book by war historian Peter Slattery. 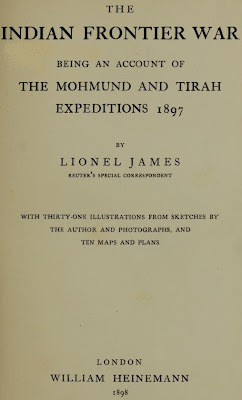 James’s first report was published in The Times on March 15, 1904; he went on to file many other despatches, including the sinking of the Russian flagship the Petropavlovsk. War correspondents in Manchuria. Is Lionel James among them? But James was later forced to move inland into Manchuria to continue his reporting of the war. From there, he sent a 5000-word story on one of the major land battles of the war at Liaoyang – the longest cable ever filed. James married Margaret Crane. In 1897 Margaret was returning from India to England and James set off to ask for her hand in marriage. He raced on horseback to Bombay, where Margaret’s ship had just departed. Undaunted by this, James swam after the vessel, climbed aboard and proposed. From 1929-31 James managed a racing stable and stud farm and until 1942 he was a governor of the Imperial Services College, Windsor. He then became governor of Haileybury school. He retired in 1946 and died at Newbury, Berkshire, on May 31, 1955, aged 84. Robert, As always a great an informative article. There is a ton of information in this one and I know I now need to read more on Mr. James. I just cannot imagine riding a camel and typing on any brand typewriter. I like his choice of the Blick. I find the machines very very interesting. Maybe one day I will be able to have one. 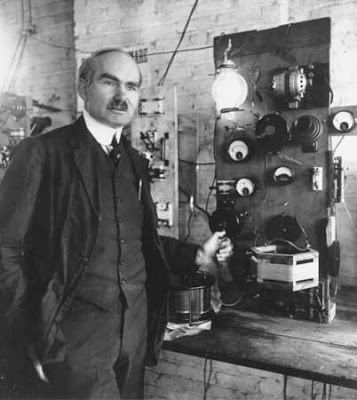 It would be wonderful if we had some recordings of his original wireless reports; only recording equipment did not exist in that era. Thank you, Bill, much appreciated. Mr James sounds like one determined operator. 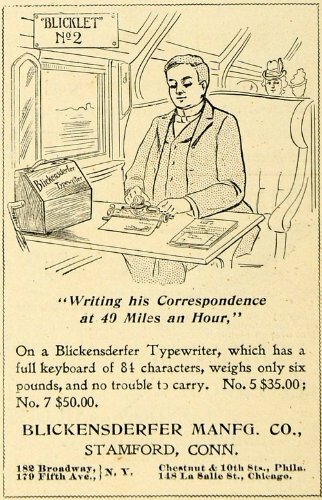 I find his willingness to swap typewriters with the Blick company quite touching somehow, not sure why. Typing on a camel - that must have been a sight! Very nice story! 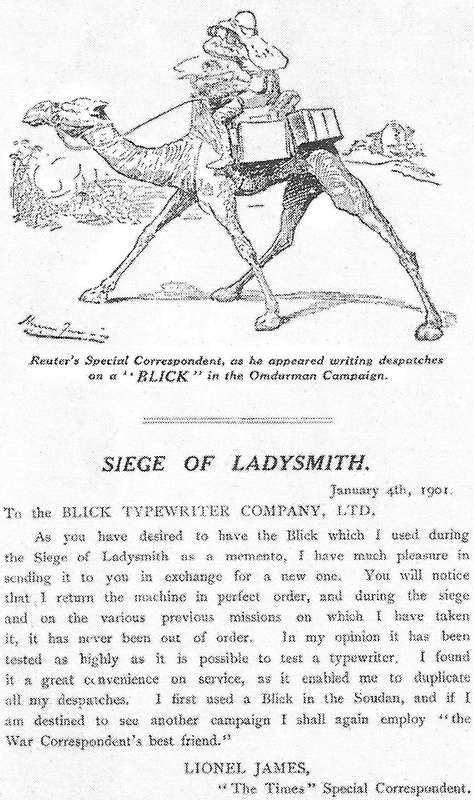 This is quite a romantic image -- the Blick-using correspondent on his camel. As a very distantly related footnote, but perhaps one worth mentioning, I visited a local market with my family the other day and found a butcher offering ground camel meat and camel sausage. What the heck?? Lionel James was the son of Lt Col Lionel Henry Septimus James (Royal Artillery). Like most if not all of his siblings, Lionel Henry Septimus was born in India, son of General Charles Butler James (1784-1870) who joined the then Bombay Army in 1802. He and his wife, Marianne (Venables) had 13 children of whom all the girls and some of the boys died young. Of the 6 who survived to adulthood 4 were in either the Indian Army or the Army (Lt Col Charles Marden Wallace James, Gen Herbert Henderson James, Capt Edward Marcus Viret James, Lt Col Lionel Henry Septimus James). Lionel James himself was married (to Margaret Crane) and had two children, Edward Lionel Batson James and Maurison Lionel James. My interest comes from being the great great grandson of Herbert Henderson James.... There is a photo of Lionel James in the Times of March 11 2004 when they published a centenary article on the wireless reports from the Yellow Sea. I've a scan of it if you are interested. 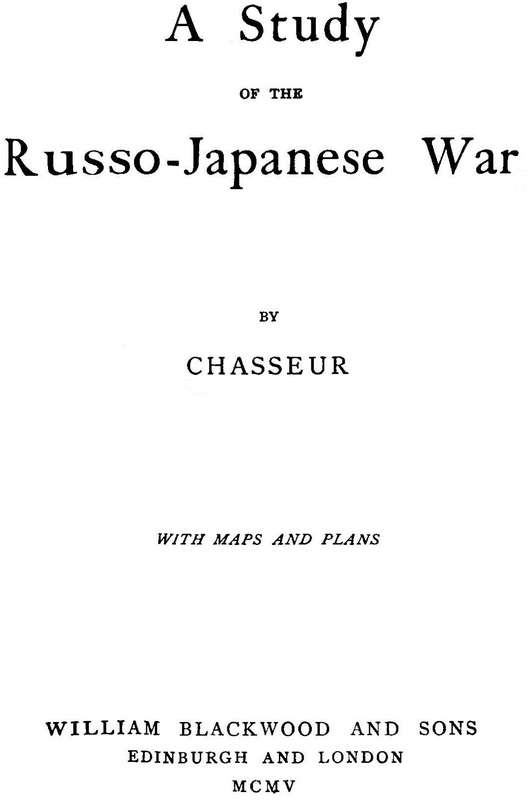 There's much more information in Peter Slattery's book, Reporting the Russo-Japanese War, 1904-5 plus at least one more photo. Lionel James was a territorial cavalry officer and was OC of King Edwards Horse in the 1st WW, which will bring more links to him.